On this tour you will learn the basics of Chicago’s vice history, all the way from the city’s first vice district, the “Sands,” to the infamous levy district and the associated debauchery, to Capone and the mob. Explore the basics of different beer styles and beer’s influence on criminal enterprises, especially during Prohibition. We take great pride in visiting locally-owned establishments. These places not only provide friendly service, but they also have character and are unique places that add to the neighborhoods. First, we will visit an old Chicago bar and restaurant where Capone himself was known to hang out. Next, we will make a stop at one of the oldest bars in the city, started by a one of the many German immigrants that moved to Chicago, still holding liquor license No. 1 after Prohibition. After, we will stop by a blues club that was started by Buddy Guy, one of the ultimate legends in the business, and finally, visit a new microbrewery that pays homage to Chicago’s vice past. Please also note also that other food tastings will be subbed in for pizza in January-March. Other location substitutions are possible from time to time based on our vendor schedules. As you can see, there is a lot that is offered on this tour – you’ll learn about Chicago history, primarily as it relates to vice – and you’ll be surprised by how many incredible stories we share. 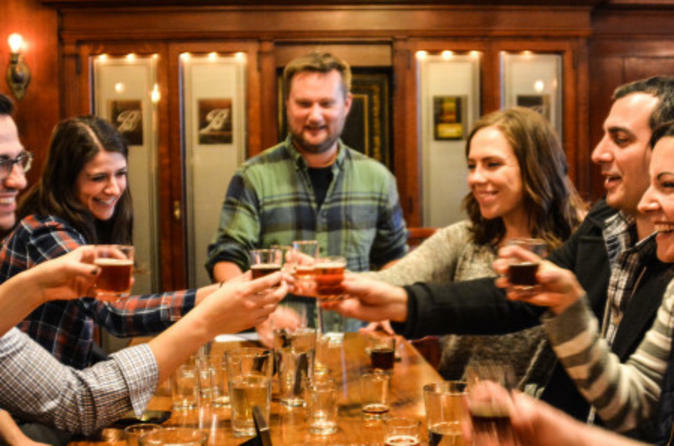 You’ll taste delicious beer from visiting unique, local establishments, with great variety on both. You’ll also walk and get a feel for these interesting neighborhoods – the Loop and South Loop are some of the oldest neighborhoods in the city, and we have no doubt that you’ll want to explore the area even more. Combining it all together with great people, including you, and it makes for an unforgettable experience. In short, our tour is a really unique experience that is fun and memorable.